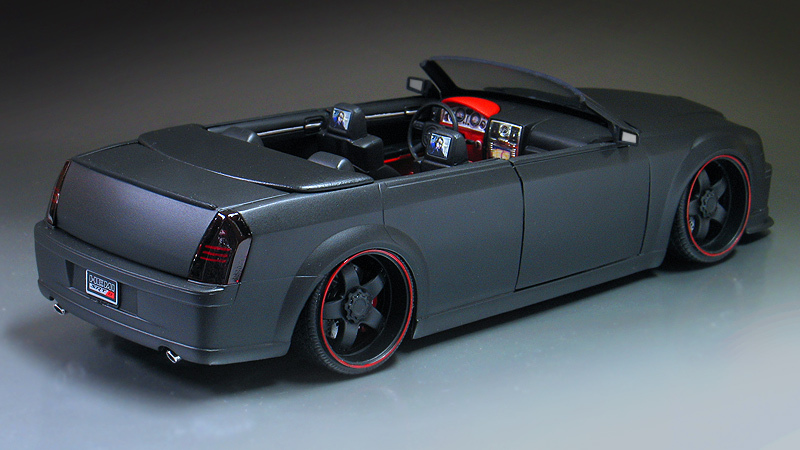 I got a Revell Chrysler 300C Hemi SRT-8 kit in a trade with another modeler. 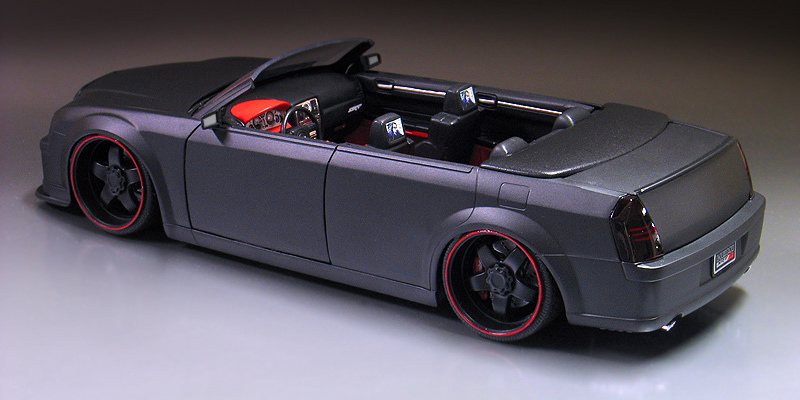 At first I was just going to use it for parts on another project I had in mind, but after I examined the kit I had the idea that it might look cool as a custom convertible speedster. I decided to built it like the kind of over-the-top, stanced-out style cars shown at the SEMA show in Las Vegas every year. With this theme in mind, I whipped out my Dremel tool and within minutes I had the top cut off. 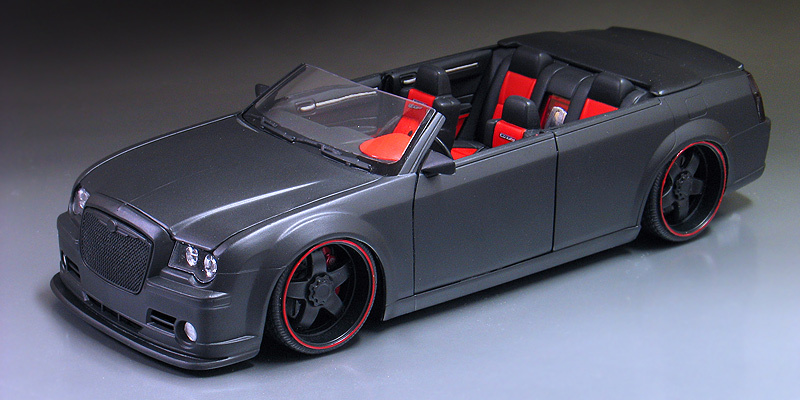 While I was at it, I decided to chop down the windshield a few scale inches and give the big Chrysler 300C a sort of speedster look. I also used the Dremel tool to remove the body side moldings and emblems. Lastly, I also added a front lip spoiler made from sheet styrene to the lower air dam. Sheet styrene and Bondo was also used to make the convertible boot. The interior was mostly built out of the box, but I did add some flocking to the carpet. 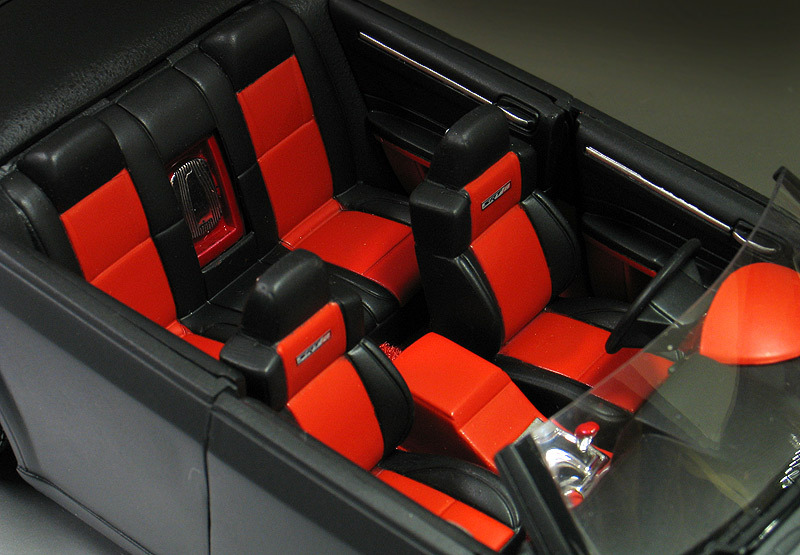 The rear speaker were also moved to make way for the convertible boot. With the body mods done, I turned my attention to paint. 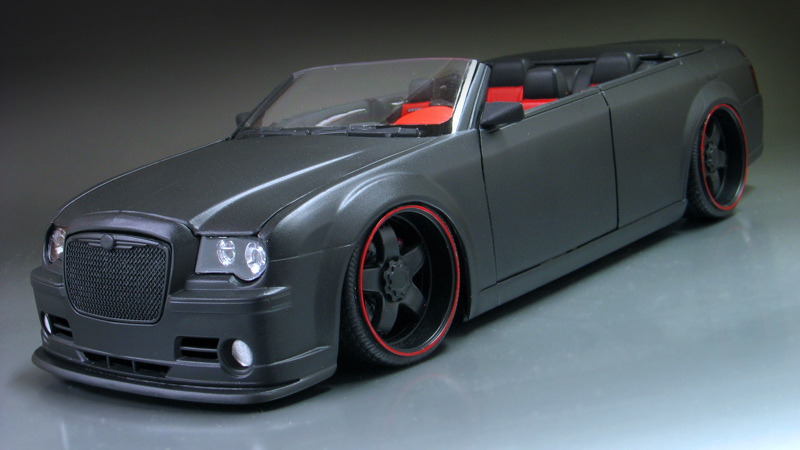 I decided my Chrysler would look even more sinister murdered out in a coat of flat black, so everything on the exterior including the wheels were painted that way. BTW, my favorite flat black paint is the cheap stuff you can get from Home Depot. It's only 99 cents for a full sized can. I also blacked out the tailights and headlights. The monster sized 24" Revell kit wheels were replaced with a more reasonably sized set of 22" wheels from a Testors diecast Escalade kit. Lastly, I painted the leading lip of the rims with a red stripe just to break up the black paint a little and tie the color scheme of the interior to the exterior. Then the car was slammed and stanced. I can just imagine myself cruising down the Vegas strip in this big 300C with a car full of my buddies, cranking the tunes and watching the world spin by.